Become familiar with your real estate contract. I’m going to go over an example of how to make an offer with a South Austin home that’s currently on the market. The information is listed below. 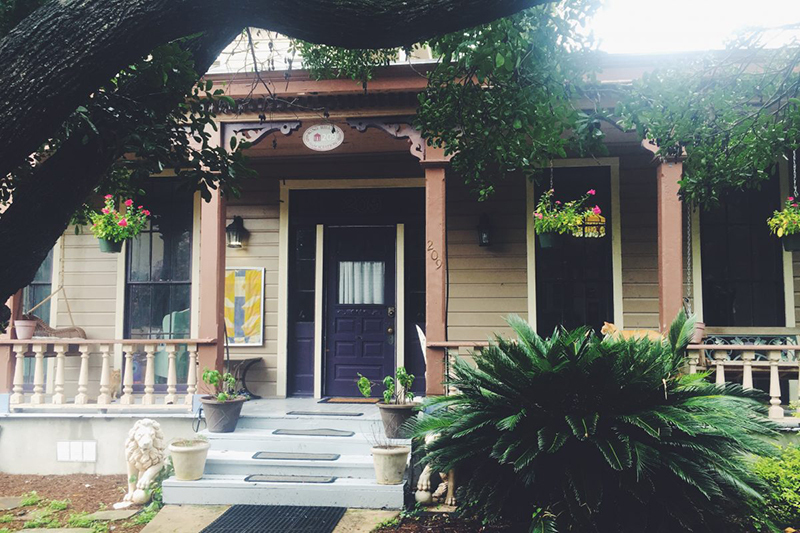 In the Austin market, the process of buying a house can seem like a rushed process. With low housing inventory, many of my buyers have made quick moves if they see a property and fall in love. This can happen even after only seeing a few homes. It can be overwhelming. An unfamiliar contract is thrown your way, there’s talk of an inspection, option periods, contingencies and deadlines. It can seem like a lot to a first-time buyer. Sometimes real estate agents forget just how much new information is presented to a buyer, as they’re very familiar with the process. I wanted to break down a basic “one to four family” residential contract. I’m going to go over what I had the most questions about when I first read through a real estate contract. If you have questions on something that I have not gone over, please feel free to reach out to me. I would always recommend reading all contracts in full before completely signing. 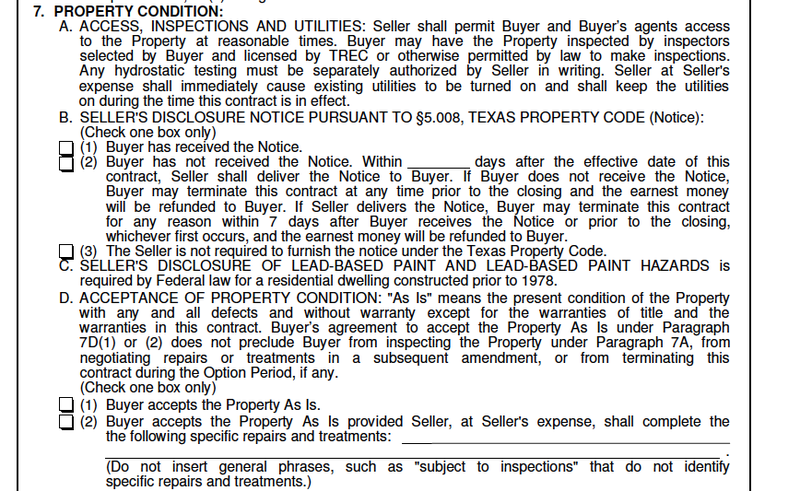 There are also full PDF versions of different types of real estate contracts on TREC’s (Texas Real Estate Commission)website for you to view. **Below, I first show a portion of the contract for you to review. It will then be followed by a brief explanation of what you just reviewed. What is earnest money? When reviewing the contract, one of the pages will discuss “option period” and “earnest money.” Earnest money is provided by the buyer so that the seller takes the offer seriously. You’re using these funds to show the seller you’re “earnest: about buying their house. Don’t confuse this with the down payment on the house. They are two separate things. The earnest money check is turned into the title company, who will hold it in an escrow account. You will lose the earnest money if you breach the contract. Otherwise, this is a deposit, and you will get it back, or it can be applied to your down payment amount at closing. When? You have 48 hours to turn in earnest and option money checks. What is a title policy? The title company researches your property, checks if there is any risk in the title chain (the historical transfers of title to a property from the present owner back to the first owner of the home) and suggests ways to eliminate that risk. After reviewing the property, the title company will send you a title commitment that will inform you of any restrictions, easements, or anything else affecting title. The title company also conducts your closing. They collect funds and record documents. Title insurance protects you as an owner from most claims and attacks on the title. Survey: Most often, a seller will have their original survey from when they bought their home. If this is the case, you, as a buyer, may not have to pay for a new one. If unable to locate the survey, the seller can check with the title company used when he/she closed on the home. In the contract, there is a section that discusses the survey and who will provide a new one if needed. By law, sellers are required to disclose the condition of their property so that you can make the best-informed decision. Accepting the property “as is” does not mean you don’t get to make further negotiations after your inspection. This means from what you can visibly see; you accept the property as is. Also known as a residential service contract, a basic home warranty plan is about $300-$500 a year. Usually, a seller will provide this for a buyer for one year. There are different types of plans with various coverages, but basically, this plan maintains, replaces, or repairs any part of the appliances, structural components, electrical, plumbing, heating, or air conditioning systems in your home. Your title company will help guide you through this once you go under contract. This space is provided to add any other agreement between a buyer and seller that doesn’t fit into the contract. Real estate agents can be hesitant about filling out this section because they don’t want to appear to be “practicing law”. The option period, along with the option check, buys you time to have home inspections done and negotiate any final terms or repairs with the seller. For example, if you have a six-day option period written in the contract, you’ll have six days to have your inspection completed, come up with repairs you want, and make negotiations with the seller. Unlike earnest money, you will not get this back, but this tends to be a lot less money—typically around $100-$300. I’ve seen option period lengths as long as 12 days or as little as two days. It will depend on many things and can be used as a negotiation tactic if there are multiple offers. For example, shortening your option period as a buyer will make your offer more appealing if there are multiple. You have 48 hours to turn in earnest and option money checks. The executed date will start the countdown of all of your contingencies and dates in the contract…the survey, financing contingency, option period, etc. It’s good to keep track yourself, but it is also your Realtors job to help you with this.